Fish is a low-fat high quality Protein and is the healthiest foods on planet. It is loaded with important nutrients, such as Protein and Vitamin D.
Fish is also the world’s best source of omega-3 fatty acids, which are incredibly important for your body and brain. Proteins, Vitamins and Nutrients that can lower blood Pressure and help to reduce the risk of a Heart attack or Stroke. Lets take a closer look! Generally speaking, all types of fish are good for you. They are high in many nutrients that most people aren’t getting enough of. This includes high-quality protein, iodine and various vitamins and minerals. However, some fish are better than others, and the fatty types of fish are considered thehealthiest. That’s because fatty fish (like salmon, trout, sardines, tuna and mackerel) are higher in fat-based nutrients. This includes the fat-soluble vitamin D, a nutrient that most people are deficient in. It functions like a steroid hormone in the body. Fatty fish are also much higher in omega-3 fatty acids. These fatty acids are crucial for your body and brain to function optimally, and are strongly linked to reduced risk of many diseases (1). To meet your omega-3 requirements, eating fatty fish at least once or twice a week is recommended. Bottom Line: Fish is high in many important nutrients, including high-quality protein, iodine and various vitamins and minerals. Fatty types of fish are also high in omega-3 fatty acids and vitamin D.
Heart attacks and strokes are the two most common causes of premature death in the world (2). 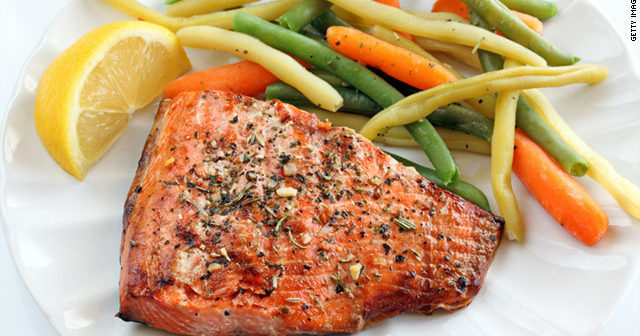 Fish is generally considered to be among the best foods you can eat for a healthy heart. Not surprisingly, many large observational studies have shown that people who eat fish regularly seem to have a lower risk of heart attacks, strokes and death from heart disease (3, 4, 5, 6). In one study of more than 40,000 male health professionals in the U.S., those who regularly ate one or more servings of fish per week had a 15 percent lower risk of heart disease (7). Researchers believe that the fatty types of fish are even more beneficial for heart health, because of their high amount of omega-3 fatty acids. Bottom Line: Eating at least one serving of fish per week has been linked to reduced risk of heart attacks and strokes, two of the world’s biggest killers. Omega-3 fatty acids are absolutely essential for growth and development. The omega-3 fatty acid docosahexaenoic acid (DHA) is especially important, because it accumulates in the developing brain and eye (8). For this reason, it is often recommended that expecting and nursing mothers make sure to eat enough omega-3 fatty acids (9). However, there is one caveat with recommending fish to expecting mothers. Some fish is high in mercury, which ironically is linked to brain developmental problems. For this reason, pregnant women should only eat fish that are low on the food chain (salmon, sardines, trout, etc. ), and no more than 12 ounces (340 grams) per week. Bottom Line: Fish is high in omega-3 fatty acids, which is essential for development of the brain and eyes. It is recommended that expecting and nursing mothers make sure to eat enough omega-3s. One of the consequences of aging is that brain function often deteriorates (referred to as age-related cognitive decline). This is normal in many cases, but then there are also serious neurodegenerative diseases like Alzheimer’s. Interestingly, many observational studies have shown that people who eat more fish have slower rates of cognitive decline (10). One mechanism could be related to grey matter in the brain. Grey matter is the major functional tissue in your brain, containing the neurons that process information, store memories and make you human. Studies have shown that people who eat fish every week have more grey matter in the centers of the brain that regulate emotion and memory (11). Bottom Line: Fish consumption is linked to reduced decline in brain function in old age. People who eat fish regularly also have more grey matter in the brain centers that control memory and emotion. Depression is a serious and incredibly common mental disorder. It is characterized by low mood, sadness, decreased energy and loss of interest in life and activities. Although it isn’t talked about nearly as much as heart disease or obesity, depression is currently one of the world’s biggest health problems. 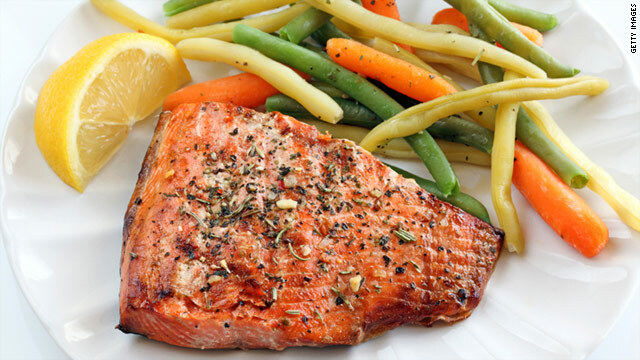 Studies have found that people who eat fish regularly are much less likely to become depressed (12). Numerous controlled trials have also found that omega-3 fatty acids are beneficial against depression, and significantly increase the effectiveness of antidepressant medications (13, 14, 15). What this means is that fish can quite literally make you a happier person and improve your quality of life. Fish and omega-3 fatty acids may also help with other mental disorders, such as bipolar disorder (16). Bottom Line: Omega-3 fatty acids can be beneficial against depression, both on their own and when taken with antidepressant medications. Vitamin D has received a lot of mainstream attention in recent years. This important vitamin actually functions like a steroid hormone in the body, and a whopping 41.6 percent of the U.S. population is deficient in it (17). Fish and fish products are the best dietary sources of vitamin D, by far. Fatty fish like salmon and herring contain the highest amounts (18). A single four ounce (113 gram) serving of cooked salmon contains around 100 percent of the recommended intake of vitamin D (19). Some fish oils, such as cod liver oil, are also very high in vitamin D, providing more than 200 percent of the recommended intake in a single tablespoon (20). If you don’t get much sun and don’t eat fatty fish regularly, then you may want to consider taking a vitamin D supplement. Bottom Line: Fatty fish is an excellent source of vitamin D, an important nutrient that over 40 percent of people may be deficient in. Autoimmune disease occurs when the immune system mistakenly attacks and destroys healthy body tissues. A key example is type 1 diabetes, which involves the immune system attacking the insulin-producing cells in the pancreas. Several studies have found that omega-3 or fish oil consumption is linked to reduced risk of type 1 diabetes in children, as well as a form of autoimmune diabetes in adults (21, 22, 23). The results are preliminary, but researchers believe that this may be caused by the omega-3 fatty acids and vitamin D in fish and fish oils. Some believe that fish consumption may also lower the risk of rheumatoid arthritis and multiple sclerosis, but the current evidence is weak at best (24, 25). Bottom Line: Eating fish has been linked to reduced risk of type 1 diabetes and several other autoimmune diseases. Asthma is a common disease that is characterized by chronic inflammation in the airways. Unfortunately, rates of asthma have increased dramatically over the past few decades (26). Studies show that regular fish consumption is linked to a 24 percent lower risk of asthma in children, but no significant effect has been found in adults (27). Bottom Line: Some studies show that children who eat more fish have a lower risk of developing asthma. A disease called macular degeneration is a leading cause of vision impairment and blindness, and mostly affects older individuals (28). There is some evidence that fish and omega-3 fatty acids may provide protection against this disease. In one study, regular consumption of fish was linked to a 42 percent lower risk of macular degeneration in women (29). Another study found that eating fatty fish once per week was linked to a 53 percent decreased risk of neovascular (“wet”) macular degeneration (30). Bottom Line: People who eat more fish have a much lower risk of developing macular degeneration, a leading cause of vision impairment and blindness. Sleep disorders have become incredibly common worldwide. There are many different reasons for this (such as increased exposure to blue light), but some researchers believe that vitamin D deficiency can also play a role (31). In a 6-month study of 95 middle-aged men, a meal with salmon three times per week led to improvements in both sleep and daily functioning (32). The researchers speculated that this was caused by the vitamin D in the salmon. Bottom Line: There is preliminary evidence that eating fatty fish like salmon may lead to improved sleep. This last one is not a health benefit, but still very important. It is the fact that fish is delicious and easy to prepare. For this reason, it should be relatively easy to incorporate it into the diet. Eating fish one to two times per week is considered sufficient to reap the benefits. If possible, choose wild-caught fish over farmed. Wild fish tends to have more omega-3s and is less likely to be contaminated with harmful pollutants. That being said, even if eating farmed fish, the benefits still far outweigh the risks. All types of fish are good for you.